I had purchased several calcium chloride-based moisture traps and set them out indoors; the prills have since dissolved--presumably, into the water that collected. 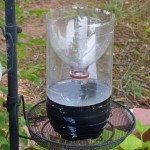 I've read/heard wisps about the beneficial uses of calcium chloride in the garden/with plants, and I am wondering if there are any practical applications or advisable uses for the solution in the traps? Or should I simply dispose of the liquid? Thank you! I would simply dispose of them. The reason being that you do not know what other chemicals were used in the traps and these chemicals could be harmful.